In March 2003, days before the United States overthrew Saddam Hussein, President Bush went on the radio to declare, “We have seen far too many instances in the past decade—from Bosnia to Rwanda to Kosovo—where the failure of the Security Council to act decisively has led to tragedy.” But behind his statement lay a bitter irony. Because, even as the United States was resolving never again to stand by and allow genocide in Iraq, it was standing by and allowing genocide in Darfur, Sudan. Over the past year, as the national security rationale for the Iraq war has deteriorated, the Bush administration has turned increasingly to moral language to justify its invasion. Which makes it all the more remarkable that it has remained so passive in the face of the greatest moral emergency on earth today. For more than a year now, in its western province of Darfur, Sudan’s Arab government has been sending its bombers and arming a militia known as the Janjaweed to slaughter and ethnically cleanse black Africans from the Fur, Masalit, and Zaghawa tribes, which the government accuses of backing a rebellion. The International Crisis Group estimates the conflict has already claimed 30,000 lives and displaced 1.2 million people. 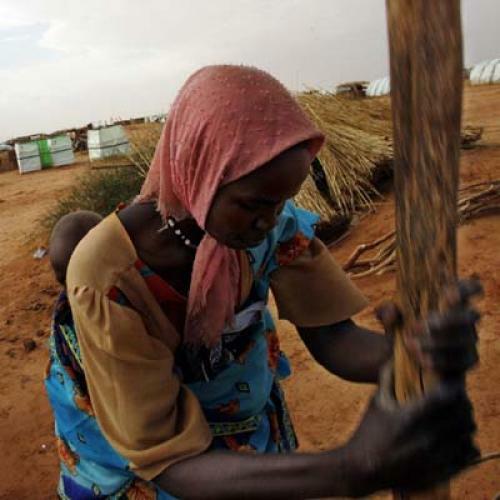 And USAID Administrator Andrew S. Natsios predicts that as many as one million people could die from starvation and disease during the current rainy season if the Sudanese continue to deny relief agencies access. So far, the United States and the world have done precious little in response. The Bush administration fears that, if it alienates the Khartoum government over Darfur, it will undermine one of its signature African achievements—the potential end to the 21year civil war in southern Sudan. China and France have resisted a U.N. Security Council resolution demanding that Khartoum halt the violence and allow immediate humanitarian access because they have oil investments in Sudan. Russia and rotating Security Council member Pakistan, both of which are combating insurgencies, object that a resolution would infringe on Sudan’s sovereignty. U.N. Secretary General Kofi Annan last week agreed to visit Darfur soon but made no further commitment. This inaction is particularly tragic because there’s so much that can be done. Khartoum has yet to make good on its promise to disarm the Janjaweed, but it clearly has influence over the militia; indeed, many Janjaweed members have close ties to the Sudanese military. And the world has influence over Sudan. In 1996, for instance, Khartoum bent to international demands and expelled Osama bin Laden. In 2001, foreign pressure helped launch new peace talks in the south. In recent weeks, the Bush administration has taken modest steps in the right direction. It has conditioned the normalization of relations with Khartoum upon an end to violence in Darfur. And it may supplement America’s current sanctions against Sudan with travel and financial restrictions that target individual government officials. To make such sanctions more effective, the United States should coordinate with its European allies, the International Monetary Fund, and the World Bank. But economic pressure isn’t enough. The African Union and European Union are currently assembling 120 soldiers to monitor the “cease-fire” in Daffur—a region the size of France. That force needs to be much larger and much more aggressive. Until the violence stops and the humanitarian crisis subsides, peacekeepers should establish safe havens for displaced persons -places where aid organizations can tend to the hungry and sick, safe from attacks by Khartoum’s killers. Given our commitment in Iraq, the U.S. military is stretched too thin to provide many troops in Darfur. (And, despite all its moralistic talk, few in the Bush administration have ever shown much enthusiasm for using the U.S. military to save African lives.) But we can offer logistical and airlift support. And, if even a fraction of the 2,000 American troops currently stationed in nearby Djibouti were transferred to Darfur, they would have a dramatic psychological impact, encouraging other countries to volunteer more troops and showing Khartoum that the world’s only superpower will no longer stand idly by. Remember, some 200 American ground troops helped end the violence in Liberia last summer. As we editorialized last week (“Were We Wrong?” June 28), one of the great moral dangers of America’s intervention in Iraq is that it will undermine America’s ability—and its will—to prevent ethnic cleansing and mass murder in other parts of the globe. We are now confronting that danger in Darfur. If President Bush wants to show the world that his moral rhetoric was sincere in Iraq, he now has his chance, in Sudan.